This cheese is EXCEPTIONAL….full of pro-biotics (belly healthful bacteria), it is incredibly creamy and delicious. Easy easy easy to make. It’s raw, its animal free, dairy free, gluten free AMAZINGNESS…..It’s sort of like, why WOULDN’T you make it?…. 3-4T water- just enough to process until smooth- less is better! In a blender, add in all of the ingredients except the water and blend until totally creamy and smooth. Add the water as needed, 1T at a time. Pour into a jar with a locking lid (gasket, air sealed) and close it up. There should be at least 3 inches of space to give the cheese a chance to bloom. Label it, date it and place in a dark and warm place for 12-24 hours. Transfer the jar into the refrigerator and allow to set up and cure for at least a week. This is a pro-biotic rich cheese! 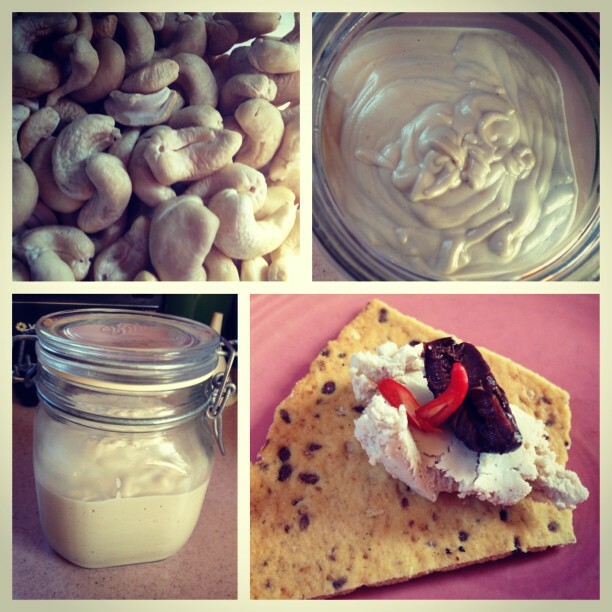 This entry was posted in breaksfast foods, cashews, fermented foods, nuts & seeds, RAW, spreads and sauces and tagged cashews, dairy free, fermented food, gluten free, nuts, pro-biotics, raw, raw cream cheese, raw nut cheese, slow fast food, VEGAN, vegan cream cheese, VEGAN LOVE. Bookmark the permalink. It’s that time again…..Time to make the cheese!!! !